"queen post." YourDictionary, n.d. Web. 10 April 2019. <https://www.yourdictionary.com/queen-post>. Either of a pair of upright posts providing tension between the top and bottom members of a truss. A supporting post designed to span longer openings than a king post. 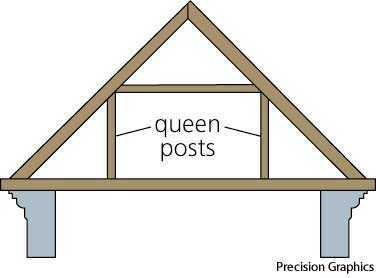 64) of queen-post trusses alternately upright and inverted.